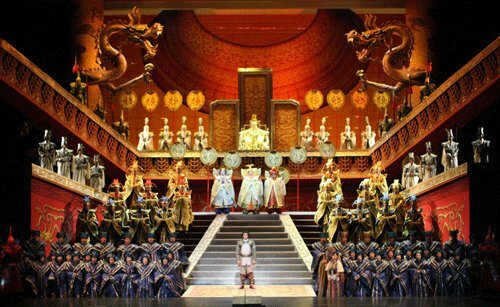 Chinese presenters have made their bid for grand opera’s international ranks with the very piece that marks the end of that tradition—Puccini’s Turandot. The irony reaches further. In the country where Chinese singers have the greatest advantage, these productions have primarily featured Western performers; a piece that had been conspicuously absent from the country where it purports to take place has wound up essentially becoming China’s national opera; and the original story was never about China in the first place—it came from a French translation of a Persian folk tale that was adapted by an Italian playwright and later reinvented by a German writer whose version inspired Puccini. This according to “A princess comes home” by Ken Smith (Opera LXIII/12 [December 2012] pp. 1473–1479). Above and below, excerpts from Turandot at the Forbidden City, directed by Zhang Yimou.